/Envelopes & Envelope Liners /How do envelope liners work? Our pre-cut envelope liners come in a variety of shapes, sizes, and colors. 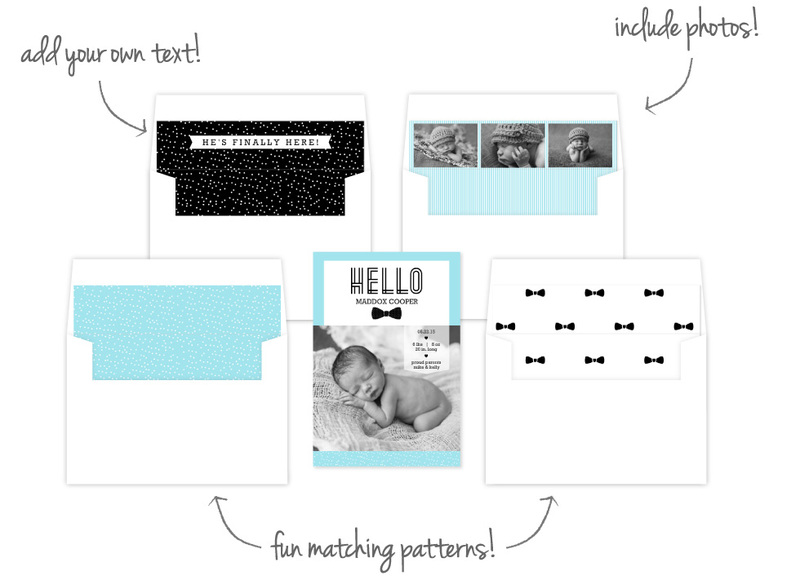 Like our other stationery, our envelope liners are fully-customizable so you can add photos, custom wording, your choice of colors, and more. Learn more about our envelope liners below. Envelope liners are sheets of paper that are attached to the inside of envelopes to add extra style to your stationery. Use them to further embellish your special event’s theme or palette or even to showcase a few of your favorite pictures. When your recipients open their envelope, they will see your personalized envelope liner inside. Our envelope liners are fully customizable and available in various envelope sizes and in many colors, designs, and patterns. Where can I find envelope liners on the site? Find our envelope liners in the stationery section of our website. You can also find them by following this link. How do I order envelope liners? Go to our envelop liner collection and choose a design you like. Make sure the design is the same size as your envelope and personalize it to your liking. Then save your design and add it to your shopping cart. Can I purchase envelope liners with a Mailing Service order? Yes, simply personalize your liners and add them to your shopping cart. We will assemble your envelope liners and envelopes for you before mailing them to your recipients. How do I assemble my envelope liners and envelopes? Simply slide our pre-cut envelope liners inside your envelopes. Then center your liners and remove the plastic strip to adhere the liner to your envelope. Find more details on assembling your envelope liners here.